Unfortunately I couldn't jam in enough CSS on Blogger/Blogspot to make this work inline in this bog entry, so I direct you to: http://alienbill.com/kirkdev/toggles.html and please "view source". There you see 10 checkboxes. The first is a boring checkbox: click on the box, a check appears. Fourth just shows that the label appearing to the right of the checkbox is just a convention: now the whole area is clickable. Example Five has us putting an arbitrary div inside the label, and showing that it too is part of clickable space. The "~" tilde selector is less used than some selectors, and a bit odd. It says "any sibling following this one"-- order is important! (And :checked is a virtual selector for when the checkbox is checked). Net-net: a class "show" sibling of the checked input is background green, not red. We've reinforced the state set by the checkbox. Example 7 shows that we can hide the checkbox itself. The code I'm borrowing from didn't use display:none, which I think might give a screenreader the wrong idea. Instead, it uses the more purely visual property "opacity". It also changed it to "position:absolute", so it didn't disrupt the flow of the other element parts. I've talked about jQuery transitions before... CSS offers fewer options but still its nice to be able to make these effects in pure CSS. Finally, 10 uses some rounded corners to make a slight less edge-y switch. As might be apparent on visual inspection the duplicate "goto fail;" is the issue. bad, for the usual "what if you put in another line of code" etc, and situations like the goto fail. is how I might do that sequence, which would also get away from the ugly goto. GOTO CONSIDERED HARMFUL, as they say. All in all, a nasty piece of work. 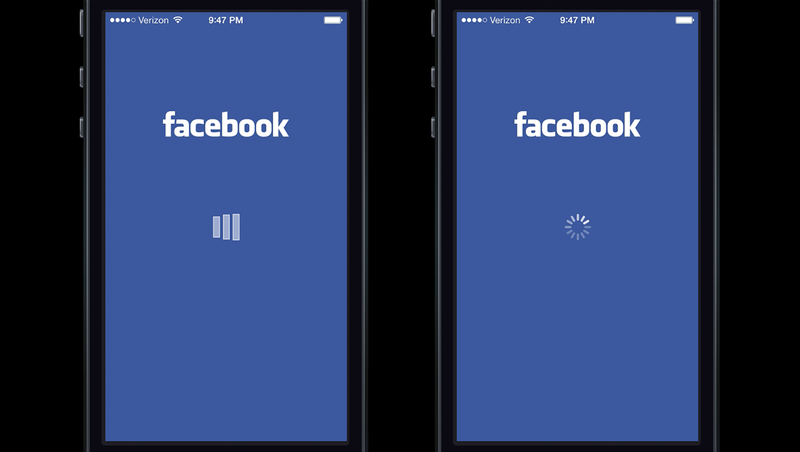 Interesting finding from Facebook... iOS users would tend to blame Facebook itself if presented with the scene on the left, and the device with the right. The logic behind it seems easy to figure out; iOS uses something like the animation on the right under many circumstances (especially when powering up/down) but the left is more app-specific. Screenshot and more discussion available at mercury.io. the Charybdis of test that blow up even with the most well meaning of refactorings. In practice I've seen tests as a way of multiplying the workload of active development, and then teams stubbing them out or otherwise ignoring lots of "red" results because while the software is actually doing its job, the tests aren't being kept meaningfully aligned with that. I keep on pondering... though I live in fear that I'll never know if I'm just rationalizing my own laziness and prejudice for "making stuff!" over "engineering", or if I can be confident enough in my own experience to really justify a stance that doesn't love unit tests. Thinking about my own coding process: I break what I want the software to do into almost ridiculously small pieces and so have a super tight code-run-inspect results loop... (I really hate situations where the a whole aggregate of code is not working but I have no idea where my assumptions are incorrect. (Pretty much all debugging is finding out which of your assumptions you made in code form is wrong, and when.)) So as I code up a complex bit, I write a lot of "runner" code that exercises what I'm doing, so that I can get to a point where I'm looking at the results as quickly as possible. This might be where I part ways from the Flock: I view this code as scaffolding to be thrown away once the core is working, but the Unit Testing faithful would have me change that into a test that can be run at a later date. There are two challenges to that: one is most of my scaffolding relies on my human judgement to see if it's right or wrong, and the other is my scaffolding is designed for the halfway points of my completed code. Parlaying it into a test for the final result that gives a yay or a nay seems tough; doing so in away that survives refactorings and also does a good job of evaluating the UI aspect of it (often a big part of what I'm working on) seems almost impossible. Some of my skepticism, too, comes from the idea that... small bits of code tend to be trivial. It's only when they're working together that complexities arise, chaos gets raised, and assumptions get challenged. So I'm more of a fan of component testing. And it's great that you've made your code so modular that you can replace the database call with a mock object but... you know, when I think about the problems I've seen on products I've built, it's never stuff in these little subroutines or even the larger components. It's because the database on production has some old wonky data from 3 iterations ago that never got pushed to the DBs the programmers are using. It's because IE8 has this CSS quirk that IE9 doesn't. In other words, stuff that automation is just terrible at finding. A coder can only write tests for things he or she can imagine going wrong. But if they could imagine it going wrong, they would have coded around that anyway. It's very hard to get someone to find something they don't really want to find. (i.e. a bug in their code.) This is why I only put limited faith in coders doing their own testing, at least when it's time to get real. I would really appreciate feedback from veterans of the testing wars here, either people who see where I'm coming from, or who vehemently disagree with me, or best yet who see where I'm coming from but can show guide me to the Promise Land of testing feeling like a good of knowing code is working and communicating with other developers rather than an endless burden of writing everything twice and still having the thing flop in production. Found this Perl script on a laptop I'm prepping to hand over... I remember hacking it together, a simple "what folders are in one folder but not the other", kind of a half-baked folder sync. Last year I wrote about some OSX Terminal tips. One was putting the full path in the bash prompt... besides my personal preference for seeing the whole thing, it means if I scroll back up in the window, I can always get back to that location via copy and paste. There's another older trick for keeping your place when navigating folders via the command line- instead of using "cd NEWLOCATION", try using "pushd NEWLOCATION". This puts a virtual bookmark where you were before the directory change. (Actually more akin to sticking your thumb at the location, since it's pretty ephemeral.) Use "popd" to get back to that spot. As an added bonus, it exercises thinking about stack notation. http://youmightnotneedjquery.com/ is a good page showing common jQuery tasks and their straight-js equivalents.